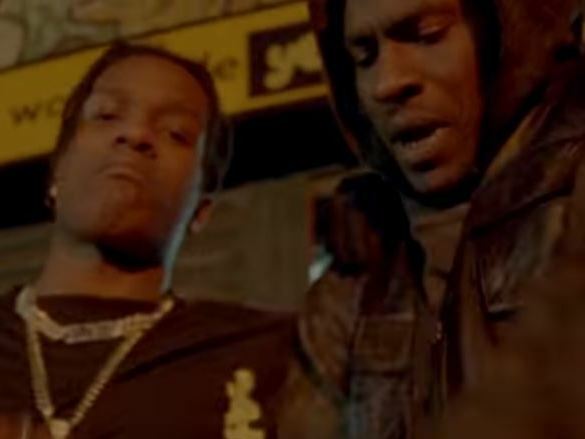 A$AP Rocky and Skepta in "Prais The Lord (Da Shine)" video. The London-New York link-up is never more vivid than when illustrated by Skepta and A$AP Rocky. Designated trendsetters of their respective cities, the two rappers are comrades-in-cool and logical counterparts when it comes to a high-end brand’s street-style co-sign or a gritty-but-pretty rap feature. Each artist’s affection for his city is evident in dialect, attitude and delivery. The new video for A$AP Rocky’s “Praise The Lord (Da Shine),” from his just-released third studio album Testing, shows just how similarly Rocky and Skep’s influence reign over the neighborhoods they each call home. More than half the visual shows Rocky and Skep split-screened, bouncing around Harlem and Tottenham — faded bodega awnings, Avirex jackets and dim hallways — along with some vertiginous special effects. High-rise buildings contract to the bass line like slinkies, while Skepta and company head nod and half-jump.